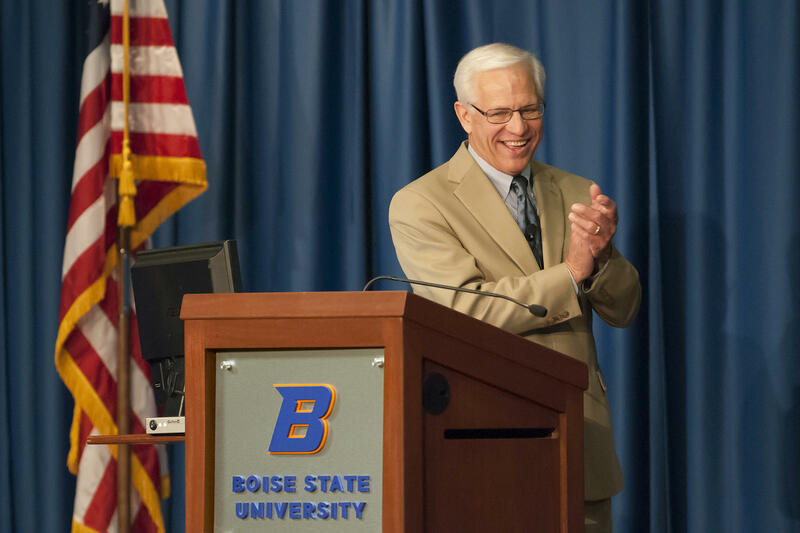 Bob Kustra began his weekly radio show on Boise State Public Radio in 2003, shortly after becoming president of Boise State University. Since then, he has interviewed nearly 500 writers and thought leaders on his program, including winners of top literary awards and many authors of bestselling novels and nonfiction. Among his many notable interviews are conversations with former secretary of defense Leon Panetta, CNN’s national security analyst Peter Bergen, bestselling novelist Ann Patchett, Pulitzer Prize winners Anthony Doerr and Elizabeth Kolbert, National Book Award winner Timothy Egan, celebrated authors Erik Larson and Candice Millard, and many others. Now in his 14th year as president, Dr. Kustra has led Boise State’s transformation to a metropolitan research university with more than 23,000 students and more than 4,000 graduates each year. Boise State now confers more than 46 percent of all bachelor’s degrees awarded by Idaho public colleges and universities. He served as president of the Midwestern Higher Education Commission and of Eastern Kentucky University. He has held faculty positions at Northwestern University, the University of Illinois-Chicago, Loyola University of Chicago and the University of Illinois- Springfield. Click here for more about Bob Kustra.